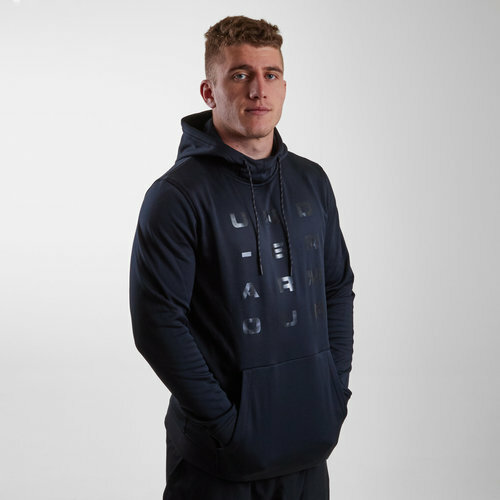 Whether you want to wear it out and about or in training this Under Armour AF Tempo Hooded Training Sweat in Black and Black is a perfect choice. This hooded top comes in a fuller cut for complete comfort wherever you may be and wherever it may be worn. This UA fleece is lightweight, breathable and stretches for that superior mobility. The soft inner layer traps in the heat to keep the wearer warm and comfortable in all weather conditions similarly with the ribbed cuffs and hem. The front kangaroo pocket means you can keep valuables locked away safe whilst the adjustable hood gives the wearer the choice of how tight they like it. the barely visible graphic across the front of the chest is the words 'Under Armour'.